LEN - www.lankaenews.com | Bureaucrat alias booruwa rat who raised salary by 160% to Rs. 850,000.00 trapped ! His salary exceeds even president’s! 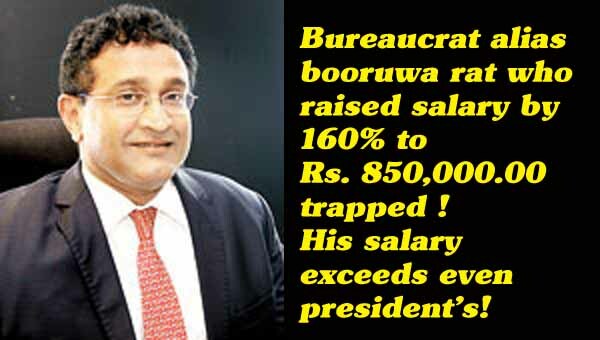 Bureaucrat alias booruwa rat who raised salary by 160% to Rs. 850,000.00 trapped ! His salary exceeds even president’s! (Lanka-e-News - 17.April.2018, 6.30PM) An investigation has been launched by the ministry of Development strategies and International trade against Duminda Ariyasinghe the Director General of the Investment Board who illegally raised his salary by 160 % whereby his present salary is more than that of even the president. Development strategies and International trade ministry secretary Ms. Chandani Wijewardena had already commenced investigations into this racket of Ariyasinghe who raised his salary by 160 % ,only with the approval of the Board of Directors . That is he raised his monthly salary to Rs. 850,000.00 illegally. The secretary of the ministry Chandani has informed the secretaries of the president and the prime minister that the salary cannot be raised only with the approval of the Board of directors. It is Public Corporation (Financial) Control Act 1971 No. 38 which governs the financial administration of State Institutions and Corporations. However Duminda Ariyasinghe has been collecting a monthly salary of Rs. 850,000.00 over a long period after deceiving the board of investments, and violating the financial regulations .Duminda was appointed to that post in January 2016. This constitutes a high scale financial appropriation via disbursement. No government officer in the country receives a salary this high. Even the president’s salary is lower than this. In any case the ministry has ordered the culprit to immediately return whatever payments he has illegally collected as salaries to the government. There is also a great likelihood for him to be dismissed from the post while the investigations are under way, based on reports. What is rudely shocking is , even after collecting this colossal salary this bureaucrat alias booruwa rat had not been able to bring in even a single dollar investment into the country ! Many members of the board are of the view that this booruwa rat is suffering from a mental derangement because of his conduct which is hostile to investors , and antagonistic to investments.